Create Your Own Custom Bundle! Simply buy the credits you need to complete your CLE requirements and choose your courses later. *When purchased through a multi-credit purchase plan. Unlimited credits good for 365 days. 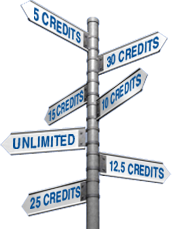 Multi-credit and unlimited plans are good for online or downloaded courses. Affordable CLE offers online California MCLE, audio and video download of continuing legal education, CA CLE.